The Last: Dan Henderson MMA’s Pound for Pound G.O.A.T ? Home / MMA / Will Raczkowski / The Last Gunslinger: Is Dan Henderson MMA’s Pound for Pound G.O.A.T ? The Last Gunslinger: Is Dan Henderson MMA’s Pound for Pound G.O.A.T ? As Dan Henderson prepares for his next outing, a rubber match to settle the score against rival Vitor “The Phenom” Belfort, many fans and journalists alike seem somewhat uneasy heading into the battle. Henderson is 44 years old, 2-3 in his last five (including a head kick KO to Belfort), and “Hendo” is in the twilight of his career in a sport where Father Time is especially merciless. The former Olympic wrestler proved he still has the legendary power in his right hand, winning his last bout with a crushing KO of the “Barbarian” Tim Boestch, but Henderson’s career as a championship caliber fighter is finally coming to an end. Currently sitting on a record of 31-13 with 15 of those wins coming via knockout, Henderson has little left to prove in a sport that he was once the king of. Still, the old lion continues to test his mettle against an increasingly savage middleweight division, choosing to go out with his boots on against anyone who will challenge him, rather than quietly slip into retirement. At this point though, fans should expect nothing less from a man who built an empire on a granite chin and sledgehammer fists. But What Is Pound for Pound? Pound for Pound is typically the idea of comparing an individual fighter’s skill level and success across multiple weight classes, with the idea being that only the most elite fighters can have their skills translate across weight-classes (either up or down) with success at the highest levels of competition. Now, while fighters like Anderson Silva, Jon Jones and George St. Pierre are undoubtedly more accomplished on paper in regards to wins and losses than many, they have never tested their metal at different weight classes against truly elite competition in a higher or lower weight class. Fighters like Frankie Edgar (UFC Lightweight Champion and now Featherweight Contender), BJ Penn (Lightweight and Welterweight champion in spite of small stature) and Randy Couture (a natural Light Heavyweight who held the Heavyweight and Light Heavyweight belts at points in his career) have all engaged the sport’s best in spite of a size disadvantage. These accomplishments make them exceptional in a “pound-for-pound sense” as despite size and weight differences, they’ve seen elite success. For those of you out there who may gripe at such a statement, just look at his titles and accomplishments. Dan Henderson isn’t exactly lacking in hardware. From a very young age, Henderson established himself as a dominant champion early in his wrestling career. “Hendo” was an exceptional collegiate wrestler, winning the national championship in Greco wrestling for Arizona State in 1991, 93 and 94. That career eventually earned him his spot on the United States Olympic wrestling team, where he placed 10th in ‘ 92 and 12th in ‘96 in the world. In regards to his fighting career, Henderson’s title collection is an impressive one. He was a UFC tournament winner when the organization was still in its infancy. AT UFC 17, Henderson defeated two men in one night (with a broken jaw) to earn himself a UFC tournament belt. From there, Henderson went on to fight for the Rings Tournament, an open weight MMA tournament (open weight meaning no weight classes). Here, Henderson defeated 5 opponents in a row, over a two night stretch, all while outweighed by 30 pounds, and bested future UFC and Pride standouts Antonio Nogeuira and “Babalu” Sobral in the process. Henderson’s budding reputation for his otherworldly toughness and ridiculous punching power earned him the opportunity to compete in Pride Fighting Championships, which at the time eclipsed even the UFC in its overall quality of fighter, spectacle and organization. Here, the legend of Dan Henderson began to take true form, as Henderson smashed his way to the greatest accomplishment of his career… becoming the first MMA fighter in history to hold two titles in two separate weight cases simultaneously for a major international promotion. Henderson would knock out “The Axe Murderer” Wanderlai Silva to take the Pride Middleweight (205 lb.) title, and narrowly defeated Murillo Bustamante in a Fight of the Year candidate to capture the Welterweight (183 lb.) title. For those who look towards lesser competition as to Henderson’s success, they could not be more off. Henderson has basically been fighting the best in the world his entire career, and overall has performed very well. He has fought 9 former UFC champions, defeating 5 of them, including the former UFC Heavyweight champion Antonio “Minotauro” Nogueria (“Big Nog”). Additionally, Henderson battled Fedor Emelianenko under the Strikeforce banner, who is considered to be the greatest heavyweight of all time, as well as to many, the greatest fighter to ever live. Emelianenko went undefeated for 10 years as Pride’s heavyweight champion, Henderson knocked him out in spite of weighing almost 25 pounds less than his opponent, as well as being 4 years older than “The Last Emperor”. Henderson has defeated former UFC Light Heavyweight champion Mauricio “Shogun” Rua twice in the octagon, winning the first affair by decision in what is wildly considered one of the greatest fights of all time, as well as knocking out the Brazilian striker in their rematch. He has also battled to controversial split-decision losses against former LHW champs Lyoto Machida and Rashad Evans, and defeated former UFC champion Vitor Belfort in Pride. 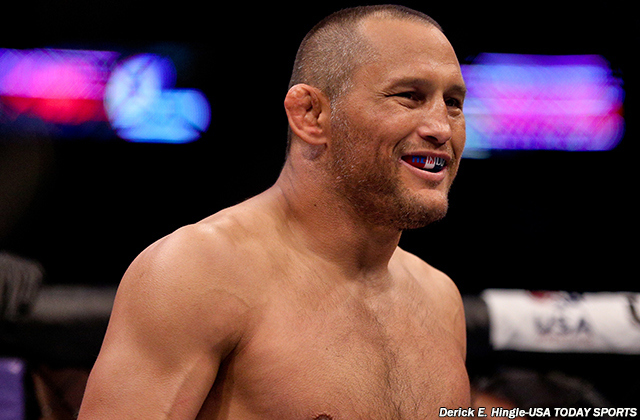 But the real question remain… is Dan Henderson the Pound-for-Pound G.O.A.T? Now, for the record I am not saying that Henderson is the sport’s overall greatest fighter ever. However, in the idea of “pound-for-pound” best, I can’t think of a fighter that has had the same level of success against three different weight classes against such a remarkably high quality of competition. Dan Henderson has proven that his skills translate across the weight-class barrier with great success, thanks to an ungodly punching power and ability to withstand punishment. His knockouts of men 30-40 pounds heavier than him, his incredible finishing percentage against bigger men, and his incredible success as a fighter until he hit his 40’s (where his is still competitive, just not as dominant) gives me the proof necessary to bestow the crown for pound for pound king on Henderson. Henderson will put the rivalry to rest with Vitor Belfort this Saturday, Nov. 7 in Brazil.